When REWIND company made a decision to develop virtual reality in collaboration with HBO’s comedy series Silicon Valley, the main goal for them was to create something unusual that will force people to come to the show and put them into the heart of it. The result was Silicon Valley: Inside the Hacker Hostel. This is an impressive VR experience of the show’s iconic completed with more than 750 interactive items. Based on the information by Kate Ellis, Head of Production at REWIND, people are able to interact with absolutely all objects in a house. Moreover, they can spend all their free time on this. Furthermore, this TV show already has many awards, and now the VR experience also is not lagging behind Silicon Valley: Inside the Hacker Hostel that won an honorary Cannes Lion reward in the Digital Craft category for 2018. 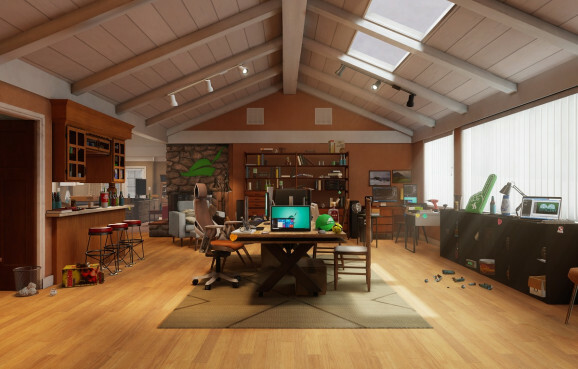 According to the Silicon Valley series, the Hacker Hostel is a tech space in country-house that is a home and office to several software engineers. VR Hacker Hostel visitors are welcomed by special notifications from the show’s heroes and they are given the opportunity to eat food, drink, play a lot of games, search for different hidden messages, walk around, play the piano or other instruments, litter and so on. In the house, there are also some references to the episodes of the show, and people are able to play the Always Blue ball game or use the Not Hot Dog app that has the unique function of identifying whether a photo is of a hot dog or not. REWIND company used Unreal Engine to develop a VR experience with hundreds of interactive objects. According to the information by Solomon Rogers, Founder/CEO at REWIND, most of Hacker Hostel was build in Blueprint using the Unreal Engine visual scripting tool. In addition, Blueprints can easily manage object animation that has intuitive graphical relationships and interactive triggers. When the team was working on the Hacker Hostel VR experience, they had some doubts about maintaining 90 fps in Unreal Engine. What did they do? They just put assets at Unreal on a day-to-day basis. However, custom profiling support was a key component and artists tested the assets themselves. In addition, the artists can use in-engine in order to see how their assets work. All in all, Unreal Engine performs a minimum 90fps frame rate for the VR experience even despite a great dataset. According to Solomon Rogers, Founder/CEO at REWIND information, REWIND is something between entertainment, ads, and film. Having such a product that is growing with us to design all these content, is the unbelievable achievement! E-Commerce Platforms: Which Are the Best For Business?